Hannah Genders plans a biodiverse wildlife haven. A s many of you will know from reading these articles, I’m really passionate about planting up areas that encourage our native wildlife. My own butterfly border has been awash with butterflies and moths this year – I understand it’s been a brilliant year for them with all the hot, dry weather, which is especially good news after a terrible year last summer when so many failed to hatch out. The flowers that attract butterflies are pretty much the same as the ones that attract bees, both bumble bees and honey bees. I’ve had loads of bees on my plants this year too, nearly all bumble bees from the very large ones to the small white-tailed bumble bees. These nest underground and are not a solitary bee; there can be up to four hundred workers in any one colony. I would like to see more honey bees here and for this reason we are looking into putting some hives in the orchard at the top of the garden. I’ve had so much pleasure from this border – not only does it look fantastic, it’s also great to know it’s helping the biodiversity of my local area and providing nectar throughout the season. I’ve had the privilege of doing a number of these borders for people who want to encourage wildlife into their garden and have been worried about the statistics on declining bee and butterfly populations that we read so much about in the press at the moment. Most of these clients have private gardens but this year I have had the opportunity to do seven borders at the Network Rail headquarters near Warwick. I’ve been working on a sustainable vegetable garden project there, transforming an area about the size of a small football pitch into a vegetable and fruit garden to provide food for the kitchens and training for the staff in community food growing. Garden Organic will be running the facility into the future, so it’s a very exciting project to be part of. Walking through the site one day with David Williams, head of the centre, we talked about the landscape around the buildings, which is beautifully kept but very corporate – mainly trees, shrubs and lawn with very little biodiversity. A large area of the building is accommodation for people on courses run by Network Rail. These entrances had an outlook on to a very attractive rill, but it was hidden by a six-foot Escallonia hedge that was not looking good after two cold winters and had died back at the bottom. We came up with the idea of ripping out the hedge and replacing it with seven long butterfly and bee borders, and creating a clear walkway through the planting into the rill area. There were some features I decided to keep: the clipped box hedging gave some formal structure to the beds along with some standard pruned Photinas and Phormiums. All this would give some height and interest to the garden in the winter when the majority of the border plants have died down. To create a link through, we also planted some low box hedging and replaced the clipped box balls at each entrance point. The rest of the planting was designed to be very flowing and natural. 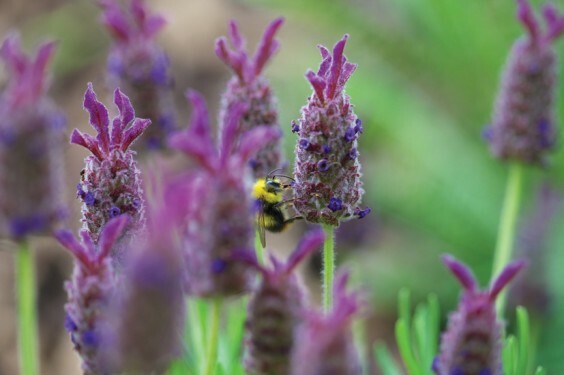 I incorporated lots of lavender in drifts through the beds – the low-growing Lavendula angustifolia ‘Hidcote’ which is an excellent plant and clips to a tidy shape, plus the French lavender Lavendula stoechas. It is important to have plants that flower right throughout the season. The white-tailed bumble bees, for example, come out early and need nectar from late March onwards, so primulas and the mauve-flowered perennial wallflower Erysium are invaluable. Flowers with a “daisy” head are also excellent for beneficial insects to obtain the nectar, so for long flowering through August I added Leucanthemum and, to extend the flower colour into the autumn, Echinacea and Helenium. This autumn we will follow the drifts through with bulbs – alliums, tulips and irises – to finish off what should become a real feature for the staff and visitors to Network Rail and shows a commitment by a large organisation to increase biodiversity and encourage planting for wildlife even in the most corporate setting.